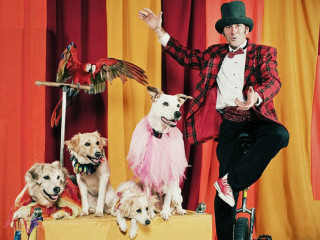 Circus Chickendog features a cast of six rescued dogs trained through positive reinforcement. In August, join these pups for a journey down "The Yellow Brick Road." Ringmaster Darren Peterson leads his furry companions — plus a Scarlet Macaw — through their interpretation of the cinematic classic The Wizard of Oz with amazing dog tricks, juggling and other feats by Peterson, and musical accompaniments from local Austin artists.